Sterilization in Dentistry is a very important and crucial aspect of providing successful Dental treatments. As Sterile instruments and sterile environment in the Dental clinic play an important role in preventing any infections. 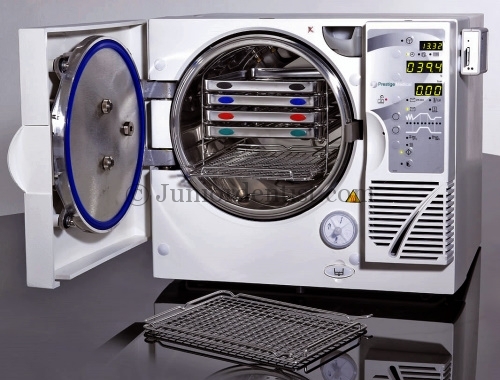 There are numerous Sterilization procedures which are available in the market like – Autoclaving, Dry Heat, Chemical sterilization, Ultraviolet light sterilization etc. All the sterilization procedures have their limitations and pros and cons as well based on which we need to decide which is the best Sterilization procedure required in our practice. Autoclaving: This the most used and most accepted method of sterilization of surgical instruments using pressurized saturated steam at 121-degree centigrade for around15-30 minutes. It is widely accepted and most used in Dental clinics to sterilize surgical instruments as it eliminates Bacteria, Virus, Fungi and Spores as well. The Effectiveness is due to the fact that steam penetrates all the surfaces of the instruments thus providing complete sterilization of the instruments without leaving any blind spots. Dry Heat: This method of Sterilization uses Heated Air or Fire to achieve sterilization with the temperature being around 180 degrees Centigrade. It helps in the killing of microorganisms using destructive oxidation method. It needs high temperature at long periods of time in comparison to Moist heat approximately 2 hours at 160 degrees Centigrade. Instruments or materials like cloth, rubbers, plastics etc cannot be sterilized. Chemiclaving: It is the process of sterilizing using chemical vapor under pressure. Chemical vapor pressure sterilizers need to acheive 131 decrees centigrade and 20 pouds of pressure for approximately 1 hour to achieve proper sterilization.